Gum disease (or periodontal disease) is caused by bacterial infection that builds up in a substance called plaque. Plaque is made up of food particles and saliva. It readily sticks to the tooth surface above and below the gum line and if not removed, will calcify into tartar (or calculus). Over time, the bacterial infection in tartar causes irreversible changes to occur. This includes the destruction of supportive tissues and bone, resulting in red gums, bad breath and loosening of teeth. Bacterial colonisation in the mouth also increases the risk of heart, kidney and liver disease as the bacteria can pass into the blood stream if the gums are bleeding and can lodge in remote sites such as diseased heart valves, in kidney or liver tissue or even bones and joints and cause significant disease. You may be surprised to know that more than 80% of dogs and 70% of cats over three years old have some form of periodontal disease. To prevent gum disease, it’s important to have your pet chew on appropriate dental chews. At Casey and Cranbourne Veterinary Hospital, we stock both Greenies and Oravet chews, both of which are low in fat and easily digested. We also stock a range of special veterinary diets such as Royal Canin Dental and Hills T/D that will help reduce the amount of plaque build up on your pet’s teeth. If your pet does not enjoy chewing, then daily brushing is the best option. This requires using a finger brush or small, soft toothbrush and pet specific toothpaste such as Dentipet toothpaste. As dogs and cats don’t spit, you cannot use human toothpaste containing fluoride. After a Scale and Polish. What should you do if you suspect your pet has gum disease? If you think your pet is showing signs of gum disease, it is important that treatment is started immediately before any irreversible changes occur. Phone Casey and Cranbourne Veterinary Hospital on (03)5996 2329 today to book an appointment with one of our veterinarians for a dental check up. 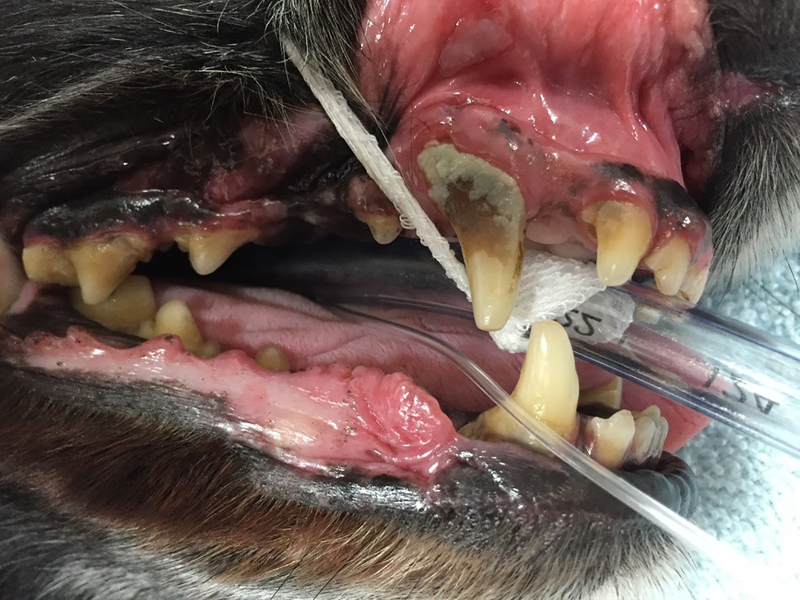 If the tartar build-up has reached the point that it won’t clean off with dental chews or dental diet, a dental scale and polish under general anaesthetic is recommended. Treating gum disease involves thorough scaling and flushing to remove tartar, plaque and infection from above and below the gum line. The teeth are then polished to help reduce future plaque build up. Any loose or rotten teeth will be removed. Just like your own dentist, we use specialised dental instruments including an ultrasonic scaler, hand curettes, air driven drills and polishers. We recommend preanaesthetic bloods prior to the dental procedure to assess the health of the kidneys and liver and we also recommend intraoperative fluids to help maintain the homeostasis of your pet during the anaesthetic. Intravenous fluids also flush the anaesthetic out of the body quicker for a smoother recovery. 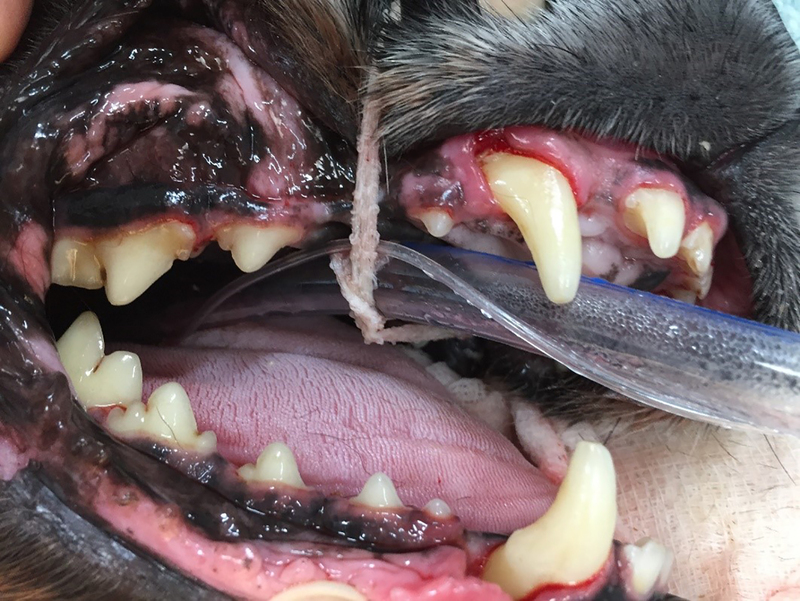 Below are pictures of a 13-year-old dog with severe (grade 4) periodontal disease with thick calculus and gum recession. In this instance, once the calculus was removed and the teeth probed, there were only two teeth that required extraction. The teeth were then all polished to help prevent future plaque build up. Preventing gum disease from reaching the point where your pet has severe bad breath, loose rotten teeth and a painful mouth is important. 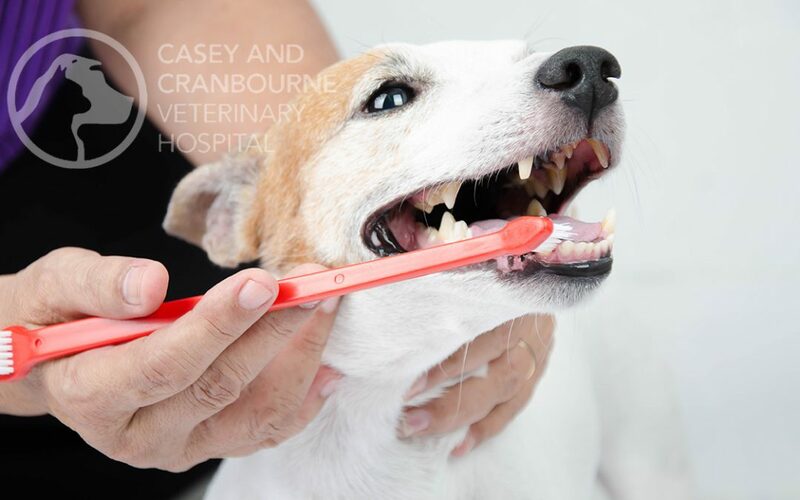 Book a dental health check today at Casey and Cranbourne Veterinary Hospital.